Garden studio with King bed - has it's own garden area with table & chairs, a delightful spot for breakfast on a beautiful Christchurch morning. Cooking facilities consist of a microwave oven, 2 hob ceramic cook-top & refrigerator. WiFi access avail. in all units(5Gb complimentary each 24 hours). We can provide cooked or continental breakfasts but cooked are only available Mon. 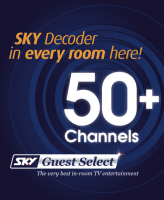 - Fri. 7 SKY TV channels and a total of 18 channels to choose from. Bedding configuration: King bed - not suitable for an additional guest but can accommodate a cot for an infant. Infants Cot is free. 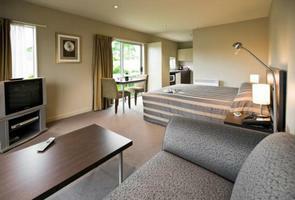 Executive ground-floor studio, has either a king or super-king bed. 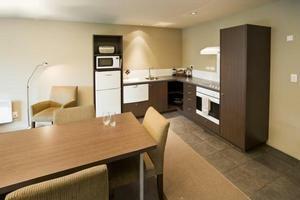 Cooking facilities consist of a microwave oven, 2 hob ceramic cook-top and refrigerator. Under-floor heating in tiled areas. WiFi access avail. in all units(5G complimentary each 24 hours). We can provide cooked or continental breakfasts but cooked are only available Mon. - Fri. 7 SKY TV channels and a total of 18 channels to choose from. Room rate is for 2 but a single bed can be added for $20. Bedding configuration: King bed and a single can be added. Units with a Super-king can be split into 2 King singles if a Twin Studio is unavailable. Infants Cot is FREE. There is a maximum of one cot per unit permitted i.e. maximum occupancy is 2 adults and 1 child in a single bed or 2 adults and an infant in a cot or 3 adults. Ground floor access studio with 2 single beds. We have had very positive comments from guests with a disability using these units. We are happy to join the beds to make a Super-king if an access unit is required or all other Studios are booked. WiFi access avail. in all units (5G complimentary each 24 hours). We can provide cooked or continental breakfasts but cooked are only available Mon. - Fri. 7 SKY TV channels and a total of 18 channels to choose from. Room rate is for 2 but a third bed can be added for $20. Bedding configuration: Two single beds - a further single bed can be added if required. 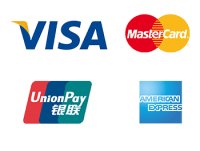 We are happy to join the beds if an access unit is specifically required or if no other Studios are available but we do need to be notified at least 24 hours prior to arrival. Infants Cot is FREE. There is a maximum of one cot per unit permitted i.e. maximum occupancy is 2 adults and 1 child in a single bed or 2 adults and an infant in a cot or 3 adults. One bedroom suite. A downstairs apartment with a king bed in the bedroom and a queen size divan bed in the large separate lounge, if required. Full kitchen incl. dish washer, fridge/freezer, m/wave, conventional oven & 4 hob ceramic cook-top. WiFi access avail. in all units(5G complimentary each 24 hours). We can provide cooked or continental breakfasts but cooked are only available Mon. - Fri. 7 SKY TV channels and a total of 18 channels to choose from. Rate is for 2 guests using the King. If the divan bed is used the extra cost is $30 per night OR it is $20 for each extra single bed up to max. of an extra 2 guests(Total occupancy is 4). An infants cot is FREE. There is a maximum of one cot per unit permitted. Bedding configuration: Has a King bed in the separate bedroom and an extra single bed can be added in the Living-room. Queens size divan bed in the Living-room. Infants Cot is FREE. There is a maximum of one cot per unit permitted and maximum occupancy is 4 guests plus an infant in a cot. Spacious 2 bedroom apartment with outside table & chairs. Kitchen has dishwasher, fridge-freezer, full oven & microwave. 1 bedroom has a Super-king bed, the other 2 King singles. Bathroom has a std. spa bath. with 7 Sky channels. Garden area with table & chairs. WiFi access avail. in all units(5G complimentary each 24 hours). We can provide cooked or continental breakfasts but cooked are only available Mon. - Fri. 42" Plasma TV with 7 SKY TV channels and a total of 18 channels to choose from. Rate is for 4 guests. Single fold down beds can be added at a cost of $20 per night each (Max 6 guests). We can join the single beds or split the Super-king if advised prior to arrival. Bedding configuration: Super King and Twin King Single beds. Rate is for 4 with a maximum occupancy of 6 as up to 2 single beds can be added in the lounge but this is really only suitable for 1 night stays. An infant in a portacot that we supply is FREE but a max. of 2 per unit is permitted. We are happy to join the singles or split the Super-king bed if notified at least 24 hours prior to arrival. An upstairs studio with either a king or super-king bed, these units have a microwave oven, ceramic cook-top and refrigerator. Under-floor heating in the bathroom plus a heated mirror. Broadband access is avail. in all units and we can provWiFi access avail. in all units(5G complimentary each 24 hours). We can provide cooked or continental breakfasts but cooked are only available Mon. - Fri. 7 SKY TV channels and a total of 18 channels to choose from. Room rate is for 2 but a single bed can be added for $20. Bedding configuration: King or Super-king bed, can add an extra single bed if required. Units with a Super-king can be split into 2 King singles, as request, if a Twin Studio is unavailable. Infants Cot is FREE. There is a maximum of one cot per unit permitted i.e. maximum occupancy is 2 adults and 1 child in a single bed or 2 adults and infant in a cot or 3 adults. Executive One Bedroom Suite with Spa bath. This apartment has a king bed in the bedroom and a queen divan bed in the lounge, if required. It has a full kitchen incl. dish washer, fridge/freezer, m/wave oven, conventional oven & 4 hob ceramic cook-top. WiFi access avail. in all units(300Mb complimentary each 24 hours). We can provide cooked or continental breakfasts but cooked are only available Mon. - Fri. 7 SKY TV channels and a total of 18 channels to choose from. 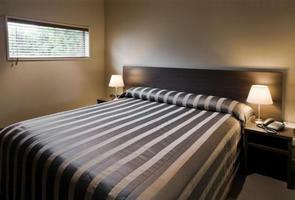 Rate is for 2 guests using the King bed. If the divan bed is used the extra cost is $30 per night OR it is $20 for each extra single bed up to a max. of 2 extra guests with a maximum occupancy of 4 guests. Bedding configuration: King bed and an extra single can be added. Rate is for 2 guests using the King bed. There is a Divan bed in the lounge suitable for an extra couple at a cost of $30.00 or if preferred up to 2 single beds can be added at a cost of $20.00 each but availability of the extra single beds needs to be confirmed as we have a limited number. NO charge for an infant's portacot. Spacious 2 bedroom Upstairs apartment. Has a full kitchen incl. dishwasher, full oven, m/wave, fridge/freezer & the bathroom has a std. spa bath. One bedroom has a Super-king bed, the other 2 singles. WiFi access avail. in all units (5G complimentary each 24 hours). We can provide cooked or continental breakfasts but cooked are only available Mon. - Fri. LCD TV with 7 SKY TV channels and a total of 18 channels to choose from. Rate is for 4. Up to 2 single fold down beds can be added at a cost of $20 each per night. We can join the single beds or split the Super-king bed if requested prior to arrival. Bedding configuration: Super King plus Twin King Single beds. Rate is for 4 but a further 2 single beds can be added if required at a charge of $20.00 per night each with a maximum occupancy of 6 guests. 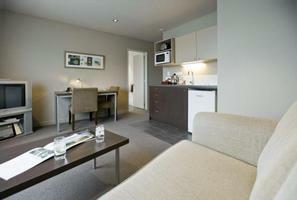 This is suitable for one night stays but not really for longer than that. We are happy to join the singles or split the Super-king bed if notified at least 24 hours prior to arrival. An infant in a portacot that we supply is FREE but a maximum of 2 per unit applies. This Upstairs Apartment has a king bed in the bedroom with a separate living area and the same kitchen facilities as our luxury Studios. Complimentary internet access is available in all our units (Limits apply) and we can provide cooked or continental breakfasts but cooked are only available Mon. - Fri. 7 SKY channels, 18 TV channels in total. Rate is for 2 guests in the King bed but there is a divan couch which can accommodate either one or 2. The cost for 1 extra guest is $20 per night or $35.00 for 2 extra guests. There is NO charge for a portacot. Maximum occupancy is 4 guests(2 guests in King bed & 2 guests in Divan bed) and one infant in a cot but this only really suitable for a one night stay..
Bedding configuration: King bed plus there is a divan couch which can accommodate either one or 2. The cost for 1 extra guest in the divan bed is $20 per night. An infant in a portacot that we supply is FREE. There is a maximum of one cot per unit permitted i.e. maximum occupancy is 3 guests(2 guests in King bed & 1 guest in the Divan bed) but it is allowed to have an infant in a cot. Two storey Apartment with 3 bedrooms upstairs & a single bedroom downstairs. The Main has it's own en suite bathroom and walk-in robe. Bathroom has a walk-in shower and a Spa bath. There is also a bathroom with toilet on the ground floor. Fully equipped kitchen including full oven, gas hob, dishwasher, microwave and generous storage. Lovely outdoor area with table and chairs. Ideal for long stays. 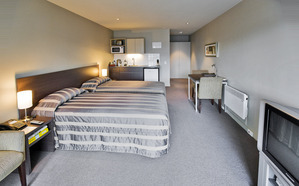 For long-stays we fully service the apartment every 7 days which includes linen change and vacuuming etc.. Complimentary internet access (Limits apply). Bedding configuration: Main has King, second bedroom has a splittable Super-king i.e. can be 2 singles, third bedroom has a Queen and the fourth bedroom downstairs has a single. The downstairs bedroom also has a desk/workstation. Rates do vary according to the number of guests and bedrooms used as bedrooms not used can be closed off to reflect the rate paid.